Durability and Comfort - How Will It Hold Up? I have spent more money on bags that have fallen apart then I think I would have if I just purchased the higher quality option at first. My attempts at being “cheap” haven’t really paid off, and that explains why I’m on this quest now. Durability and comfort are things that have to be paid attention to if you travel a lot. The more time I spend in the workforce, the more time I find myself on the road for my employer. While I don’t mind, it does mean I have to think about things I didn’t really consider before – like whether the wheels on my suitcase will last or if I will be happier with in-line or spinner wheels. Rather than throwing out bags after a few uses, I have durability on the mind now. There are different ways that bags can be durable, and these are all things you should look for when searching for your perfect piece of luggage. Durable bags don’t flex too much, and they won’t crack or break if something unintentionally tries to puncture them. Soft side bags should have reinforced corners that won’t collapse if they get some use. You will want fabrics that feel substantial, and if it looks like canvas or something similar, check for pulls throughout the fabric that could be a problem. Hard side bags can dent, so if that’s going to be a problem, you probably want to stay away from this type of construction. Also, hard cases can get scratched, but many have specially designed textures on the outside that can stop this from happening (or at least disguise it well). Some of the biggest complaints about many pieces of luggage are wheels that often break, handles that stop raising or lowering, and zippers that either lose the pulls or will no longer move back and forth. The zipper pull issue is a pretty easy fix because you can usually just clamp it down with pliers and tighten it so it won’t lose the pull. Comfort is way more subjective than durability, and it’s hard to say what one person will find comfortable compared to another. That being said, if you’re tall, you’ll want to make sure that extendable handles reach far enough so you don’t have to stoop in order to pull them. If you’re small, make sure bags to be carried won’t drag on the ground when held at a comfortable height. Other issues of comfort are also matters of convenience. For instance, some bags are made so you can attach a smaller bag to the handle of the rolling bag. If that’s something that will make maneuvering easier for you, then you’ll probably want to look into that. Durability is an issue that most people can relate to, and it isn’t as subjective as matters of comfort are. Comfort is a whole different beast. My husband LOVES to sleep on the floor of the loft in our house despite the fact that we have a house full of really nice furniture. I would never find that comfortable. I can’t argue with him though, and at least I know where he is! Luggage is much the same. What I like to carry, he might hate. Wheels that work well make travel more convenient and comfortable for just about everyone. The rest is basically trial an error based on your own experience. That’s how subjective matters of comfort can be. Pick a Wheel. Any Wheel. 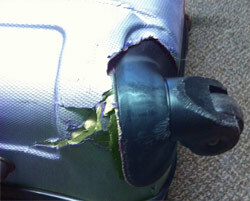 Durability and comfort is something you should consider when buying a new set of luggage, or indeed, a bag on its own. However, while the points above will help you there are no hard and fast rules!